We at Freestone Ranch are grateful for the support of our community in all its forms; in fact, the crux of our business model is our beef share program. The beef share approach is similar to the Community Supported Agriculture model that so many beloved vegetable farms employ with their weekly CSA box model. For veggie farms, the idea is pretty simple: Prior to the start of the growing season, community members committed to environmental health, social equity, and local economy can sign up for a CSA box, paying at least some portion of the cost of its production up front. Doing so at the start of the season allows the farmers to have the cash flow needed to buy the seeds and amendments, hire good workers and pay them fairly, and (just as importantly,) plan their production forecast to ensure they are meeting local demand without waste. In return, the share members get fresh vegetables week after week at peak nutrition, as well as the satisfaction of knowing they sustained the livelihoods of local farmers. Our grassfed business operates similarly, but on a bit of a different timeline. Whereas vegetables are grown season by season, beef cattle operate on about a 3 year cycle. That’s just for one animal, and doesn’t include the time it takes to raise a mother cow to adulthood to produce a calf to begin with. At Freestone, we practice a low-input system that means we can fully account for the feed that grew your animal–the animal you yourself will be eating to build your own tissue and bone. Our cows raised in this system take longer to mature than those finished on artificially cheap inputs like soy, corn, and wheat, or lots of off-site hay. As a result, our animals aren’t ready to eat until they are two to three years old. This means any animal you eat this year was the result of management decisions made several years back, and the animals born this year won’t come to fruition for a few years yet. This is true “slow food.” We are playing a long game with the land we love. During that time, the animal is doing wonderful things for the land. It’s kind of a win-win: We get to keep the animal around for a while, directing its interaction with the land in a way that makes both the cow and the grass, soil, and trees healthier habitat for all sorts of critters, from soil bacteria and fungi to badgers and coyote to migratory raptors that bless our land every year. All the while, the animal is growing its skeletal structure and muscle mass on that land. Once the animal is over 2 years old, they are best able to put on a layer of fat from our healthy grasslands that make for the extra “yum” factor you hear us talk so much about. And by then, a new crop of animals is ready to replace the older ones. To honor the carrying capacity of the land we love, it’s time to move the finished animals out into our community. And once it’s done, you get to eat it with the assurance that you’re supporting land and people here in your immediate area. This is true protein accountability, and it’s how broad landscapes like our native coastal prairies can change for the better. Over the years, we have developed strong opinions about how animals should be raised within our environments. In fact, that’s why we started raising beef cattle to begin with: We saw that the grasslands on our property really needed a big bunch of grazing animals to keep the grass and soil healthy. 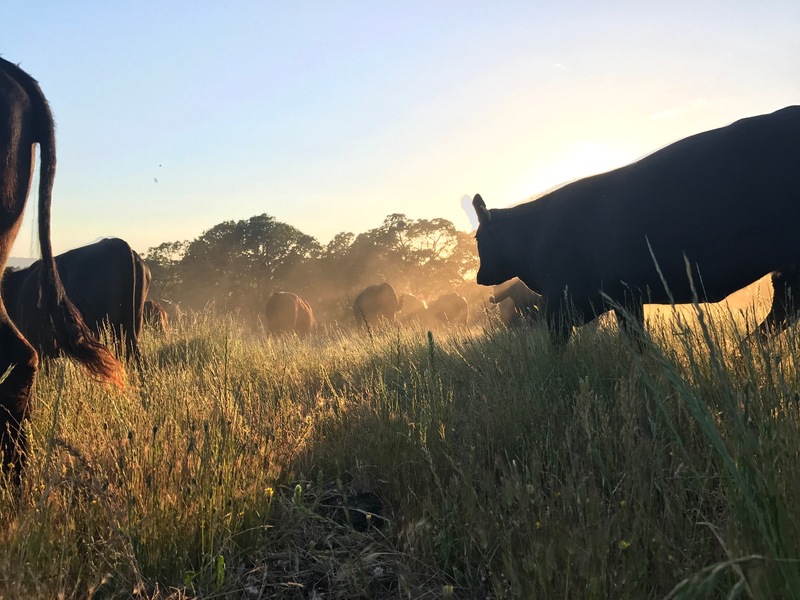 Conventional ranching would turn cattle out in the same pasture for months at a time to eat down the grass before moving on, but we knew that with some extra effort and planning, our cows can actually benefit land, and grow more plants and soil in their wake. At Freestone, profit is not our first measure of success. We look to the number of new native perennial grasses growing in our pastures, by the turtles and fish in our streams, and the wildflowers that bloom each spring. We measure success by the coyotes that den safely on our property, and the hawks that feast on our rabbits, and the deer that raise their young here. But these things are features of good management, and good management must be financially supported for it to be sustainable. That’s where you come in. Like annual vegetable farmers, the core of our model is a CSA. Or maybe we should call it a CSG: Community Supported Grasslands. Because our beef business allows us to practice the stewardship we think this land deserves. The best way we have to sell the amount of beef our lands can produce (and the amount of beef it takes to support that land), is through beef shares directly to our community. Unlike the option of selling beef into the commodity market or wholesale to distributors, selling directly to you means we can achieve the price we need to continue our land care and outreach work, while keeping our beef right here in the community. For some economic transparency, see: Our Business Context. – Develop a Beneficial Beef Club program, wherein our CSG members can spend time on the land they directly support. – Continue to improve our animal handling and skillful grazing to increase the health of the herd and the land. – Develop more water points to allow us to better graze parts of our ranch. – Plant more native trees and shrubs to improve shade, biodiversity, and carbon capture on our land. – Finish more beef to allow more members of our community to re-localize their protein. Whether or not we can do those things depends on how the rest of this harvest season goes. What can you do? – Choose to source more of your protein locally buy buying a quarter, half, or whole cow. Put your deposit in today to secure your spot in our next harvest. – Be a local food hero by buying a share and splitting it among friends. All it takes is one person to organize this. Write us, and we can help you divide your share evenly with others. – Interact with us to help us get the word out. Review our Summer Beef Campaign page and consider emailing to some friends. “Like” our page on Facebook, follow our posts. Our biggest obstacle right now is getting the word out about our beef to our community. Interacting with our social media posts means more people will see it. – Share this post with friends on Facebook and Instagram. Word of mouth is everything. In many ways, this health of this land is a reflection of how much healthy environments and and local protein is valued by our community. Thank you so much for joining us in this effort.